The ancient Greek drama, is a theatrical culture that flourished in ancient Greece from c. 700 BC. The city-state of Athens, which became a significant cultural, political, and military power during this period, was its centre, where it was institutionalised as part of a festival called the Dionysia, which honoured the god Dionysus. 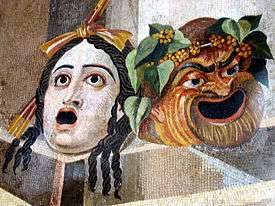 Tragedy (late 500 BC), comedy (490 BC), and the satyr play were the three dramatic genres to emerge there. Athens exported the festival to its numerous colonies and allies in order to promote a common cultural identity. The word τραγῳδια (tragoidia), from which the word "tragedy" is derived, is a compound of two Greek words: τράγος (tragos) or "goat" and ᾠδή (ode) meaning "song", from ἀείδειν (aeidein), "to sing". This etymology indicates a link with the practices of the ancient Dionysian cults. It is impossible, however, to know with certainty how these fertility rituals became the basis for tragedy and comedy. The classical Greeks valued the power of spoken word, and it was their main method of communication and storytelling. Bahn and Bahn write, "To Greeks the spoken word was a living thing and infinitely preferable to the dead symbols of a written language." Socrates himself believed that once something was written down, it lost its ability for change and growth. For these reasons, among many others, oral storytelling flourished in Greece. Greek tragedy as we know it was created in Athens around the time of 532 BC, when Thespis was the earliest recorded actor. Being a winner of the first theatrical contest held in Athens, he was the exarchon, or leader, of the dithyrambs performed in and around Attica, especially at the rural Dionysia. By Thespis' time, the dithyramb had evolved far away from its cult roots. Under the influence of heroic epic, Doric choral lyric and the innovations of the poet Arion, it had become a narrative, ballad-like genre. Because of these, Thespis is often called the "Father of Tragedy"; however, his importance is disputed, and Thespis is sometimes listed as late as 16th in the chronological order of Greek tragedians; the statesman Solon, for example, is credited with creating poems in which characters speak with their own voice, and spoken performances of Homer's epics by rhapsodes were popular in festivals prior to 534 BC. Thus, Thespis's true contribution to drama is unclear at best, but his name has been given a longer life, in English, as a common term for performer — i.e., a "thespian." More is known about Phrynichus. He won his first competition between 511 BC and 508 BC. He produced tragedies on themes and subjects later exploited in the golden age such as the Danaids, Phoenician Women and Alcestis. He was the first poet we know of to use a historical subject – his Fall of Miletus, produced in 493-2, chronicled the fate of the town of Miletus after it was conquered by the Persians. Herodotus reports that "the Athenians made clear their deep grief for the taking of Miletus in many ways, but especially in this: when Phrynichus wrote a play entitled "The Fall of Miletus" and produced it, the whole theatre fell to weeping; they fined Phrynichus a thousand drachmas for bringing to mind a calamity that affected them so personally and forbade the performance of that play forever." He is also thought to be the first to use female characters (though not female performers). After the Great Destruction of Athens by the Persian Empire in 480 BCE, the town and acropolis were rebuilt, and theatre became formalized and an even greater part of Athenian culture and civic pride. This century is normally regarded as the Golden Age of Greek drama. 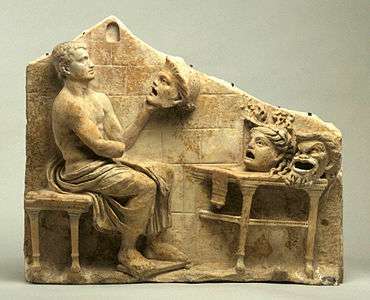 The centre-piece of the annual Dionysia, which took place once in winter and once in spring, was a competition between three tragic playwrights at the Theatre of Dionysus. Each submitted three tragedies, plus a satyr play (a comic, burlesque version of a mythological subject). Beginning in a first competition in 486 BC each playwright submitted a comedy. Aristotle claimed that Aeschylus added the second actor (deuteragonist), and that Sophocles introduced the third (tritagonist). Apparently the Greek playwrights never used more than three actors based on what is known about Greek theatre. The power of Athens declined following its defeat in the Peloponnesian War against the Spartans. From that time on, the theatre started performing old tragedies again. 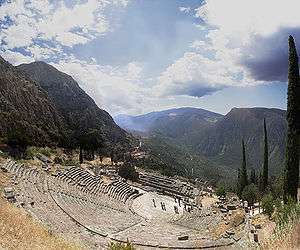 Although its theatrical traditions seem to have lost their vitality, Greek theatre continued into the Hellenistic period (the period following Alexander the Great's conquests in the fourth century BCE). However, the primary Hellenistic theatrical form was not tragedy but 'New Comedy', comic episodes about the lives of ordinary citizens. The only extant playwright from the period is Menander. One of New Comedy's most important contributions was its influence on Roman comedy, an influence that can be seen in the surviving works of Plautus and Terence. The plays had a chorus from 12 to 15 people, who performed the plays in verse accompanied by music, beginning in the morning and lasting until the evening. The performance space was a simple circular space, the orchestra, where the chorus danced and sang. The orchestra, which had an average diameter of 78 feet, was situated on a flattened terrace at the foot of a hill, the slope of which produced a natural theatron, literally "seeing place". Later, the term "theatre" came to be applied to the whole area of theatron, orchestra, and skené. The coryphaeus was the head chorus member who could enter the story as a character able to interact with the characters of a play. The theatres were originally built on a very large scale to accommodate the large number of people on stage, as well as the large number of people in the audience, up to fourteen thousand. Mathematics played a large role in the construction of these theatres, as their designers had to be able to create acoustics in them such that the actors' voices could be heard throughout the theatre, including the very top row of seats. The Greek's understanding of acoustics compares very favourably with the current state of the art. The first seats in Greek theatres (other than just sitting on the ground) were wooden, but around 499 BCE the practice of inlaying stone blocks into the side of the hill to create permanent, stable seating became more common. They were called the "prohedria" and reserved for priests and a few most respected citizens. In 465 BCE, the playwrights began using a backdrop or scenic wall, which hung or stood behind the orchestra, which also served as an area where actors could change their costumes. It was known as the skênê (from which the word "scene" derives). The death of a character was always heard behind the skênê, for it was considered inappropriate to show a killing in view of the audience. Conversly, there are scholarly arguments that death in Greek tragedy was portrayed off stage primarily because of dramatic considerations, and not prudishness or sensitivity of the audience. 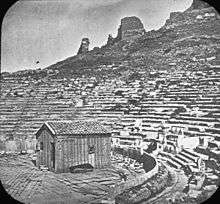 In 425 BC a stone scene wall, called a paraskenia, became a common supplement to skênê in the theatres. A paraskenia was a long wall with projecting sides, which may have had doorways for entrances and exits. Just behind the paraskenia was the proskenion. The proskenion ("in front of the scene") was beautiful, and was similar to the modern day proscenium. The Ancient Greek term for a mask is prosopon (lit., "face"), and was a significant element in the worship of Dionysus at Athens, likely used in ceremonial rites and celebrations. Most of the evidence comes from only a few vase paintings of the 5th century BC, such as one showing a mask of the god suspended from a tree with decorated robe hanging below it and dancing and the Pronomos vase, which depicts actors preparing for a Satyr play. No physical evidence remains available to us, as the masks were made of organic materials and not considered permanent objects, ultimately being dedicated at the altar of Dionysus after performances. 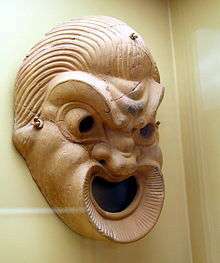 Nevertheless, the mask is known to have been used since the time of Aeschylus and considered to be one of the iconic conventions of classical Greek theatre. The actors in these plays that had tragic roles wore boots called cothurni that elevated them above the other actors. The actors with comedic roles only wore a thin soled shoe called a sock. For this reason, dramatic art is sometimes alluded to as "Sock and Buskin." ↑ Bahn, Eugene & Margaret L. Bahn (1970). A History of Oral Interpretation. Minneapolis, MN: Burgess Publishing Company. p. 3. Pathmanathan, R. Sri (1965). "Death in Greek tragedy". Greece and Rome. 12 (1): 2–14. JSTOR 642398. Varakis, Angie (2004). "Research on the Ancient Mask". Didaskalia. 6 (1). Vervain, Chris; Wiles, David (2004). The Masks of Greek Tragedy as Point of Departure for Modern Performance. New Theatre Quarterly. 67. Cambridge: Cambridge University Press. Vovolis, Thanos; Zamboulakis, Giorgos (2007). "The acoustical mask of Greek tragedy". Didaskalia. 7 (1).